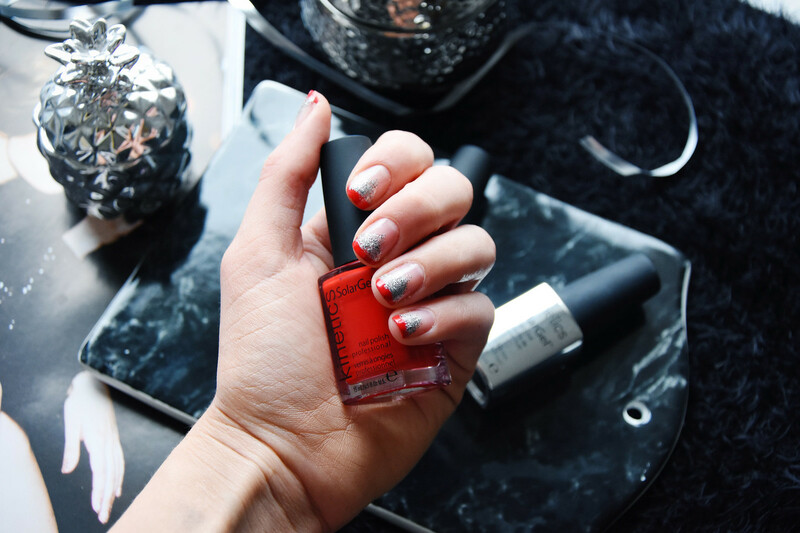 I think it wouldn’t be necessary to introduce you again to Kinetics nail polishes since I have talked about them on my blog for three times already and you already know how much I love both the brand and the nail polishes! 😊 As the holiday season is just around the corner, Kinetics has come out with a new collection called the GALA The Big Party, that will suit both Christmas and New Years Eve perfectly. “The collection calmly starts with the elegant “Met Gala”, but you don’t have to wait long till “Rhino on the Carpet” steps on the red carpet. Next is the classic “First Time Caviar” and then all of a sudden the “Spotlight Fall”, but if it weren’t enough there is no more champagne left “Running-out of Champagne”, therefore, the only thing for you left to do is to join the party in backyard “Vagabond Party”. But in the morning…”Morning After”.” I love how they’ve created a story with all nail polishes, because it makes me more engaged to the collection as well as believe the story it represents. Beautiful! Manuprāt, man būtu lieki vēl vienu reizi iepazīstināt ar Kinetics nagu lakām, jo par tām blogā esmu runājusi jau trīs reizes, un Tu jau noteikti zini ,cik ļoti, ļoti man patīk gan nagu lakas, gan arī pats zīmols! 😊 Tuvojoties spožajai svētku sezonai, Kinetics ir nācis klajā ar jaunu, svinīgu kolekciju ar nosaukumu GALA The Big Party, kas būs kā radīta gan Ziemassvētkiem, gan arī Jaunā gada ballītei. “Kolekcija iesākas mierīgi ar eleganto “Met Gala”, bet ilgi nav jāgaida, līdz uz sarkanā paklāja kāpj “Rhino on the Carpet”. Turpinājumā klasiskais “First Time Caviar” un te pēkšņi – “Spotlight Fall”. It kā ar to nebūtu gana, beidzas šampanietis “Running-out of Champagne” tā kā atliek pievienoties ballītei pagalmā “Vagabond Party”. Bet no rīta… “Morning After”. ” Manuprāt, ir tik forši, ka kolekcijai tiek izveidots šāda veida stāsts, jo tas vēl vairāk piesaista un ļauj noticēt pašai kolekcijas būtībai. Skaisti! Kolekciju var iegādāties veikalos Douglas, Stockmann, Debenhams un salonos Kolonna. Nagu laku cena 6.50 EUR. Again I can wholeheartedly say that they’ve nailed the collection as I love all eight shades. The shade I love the most is the “Running-out of Champagne” as it has microglitter in silver and in black which make the everyday manicure pop out. 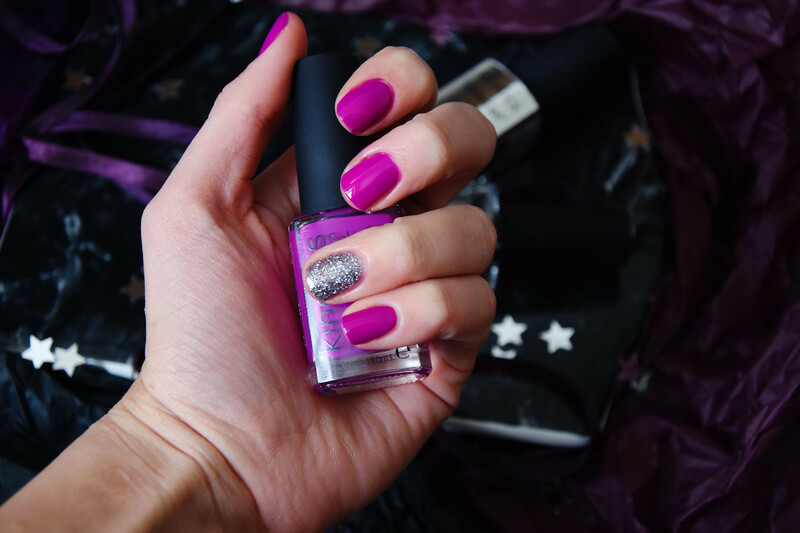 And, even though, the nail polish has glitter in it, it’s not hard to remove it from my nails, which is a common problem to those glittery nail polishes. 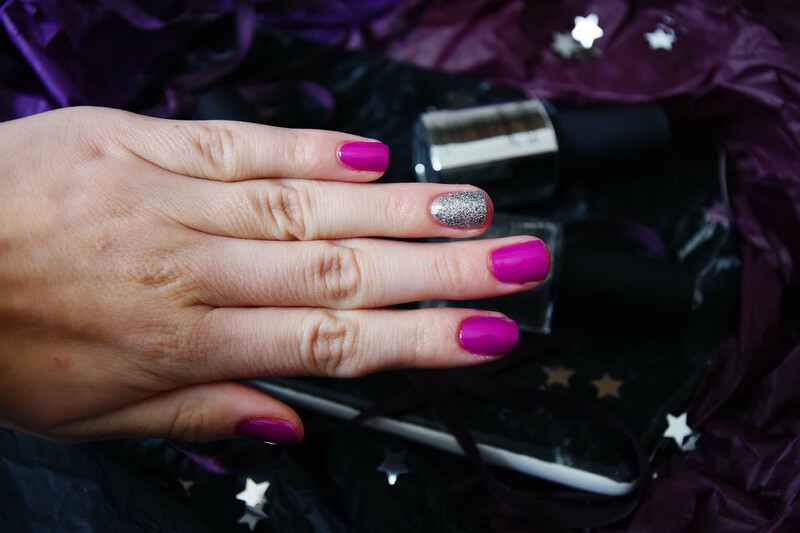 As I have mentioned it in my previous Kinetics blog posts, I always use the SolarGel top coat as it helps my manicure to last longer as well as gives it a nice shine which reminds me of a gel polish effect. 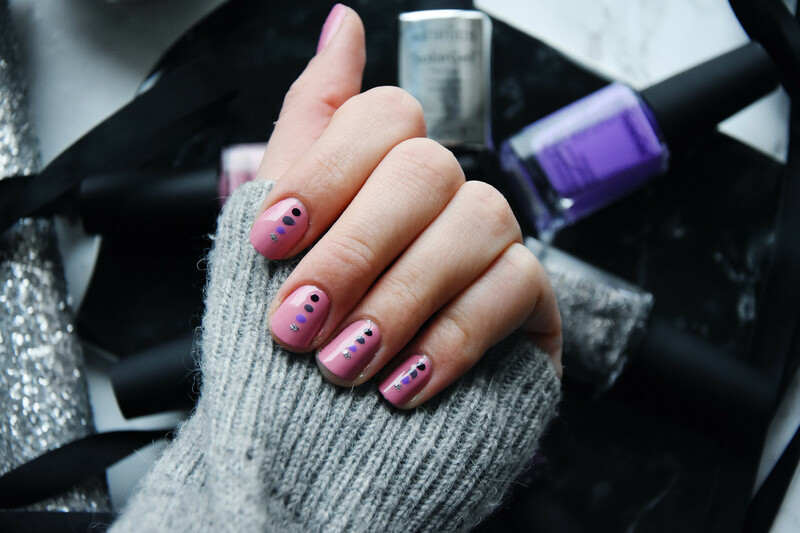 I also use the top coat because it helps the nail polish to dry more quickly (it takes around 5-10 minutes), therefore, you don’t have to wait around for hours to resume your life. 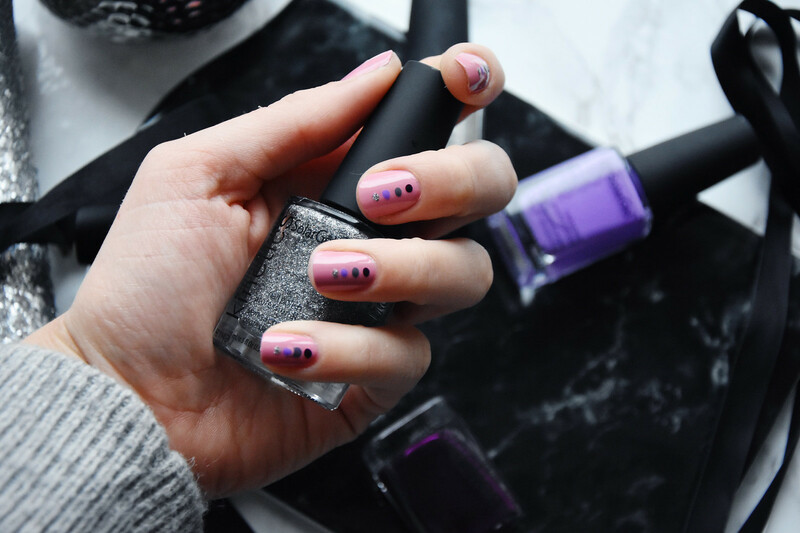 Similarly to the last time I wrote about Kinetics nail polishes, also this time I have created three super easy manicures that can be recreated in a heartbeat. I noticed that I used the nail polish “Running-out of Champagne” in all three manicures which just kind of proves how much I love it and how versatile it can be. Which manicure did you like the best? Kurš manikīrs Tev patika vislabāk? Next Post Feelunique Magic of Beauty Advent calendar GIVEAWAY!!! These colors are all beautiful! 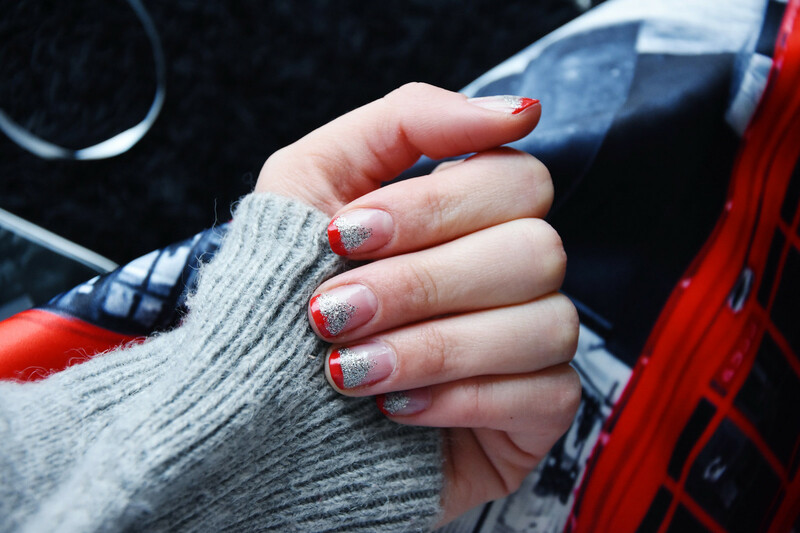 My favorite manicure is the first one, the red and silver one, that is so cute and festive! I love the colors!! Perfect nails! Aw I am so happy you liked it! Thank you Azu! Hey Maddie! How you doing? I don't know a lot about manicure and nail polish but these colors are awesome and the most important part is that they fit your personality a lot (well I think), all of them are perfect for the season, especially because they are tempting but still subtle and elegant but with a playful touch! Haha, thank you – that is such a sweet compliment!